The next New Krypton collection, Superman: Codename: Patriot, will be a good story one of these days. To its merits, writers Greg Rucka, James Robinson, and Sterling Gates deliver -- or at least tease -- a number of major moments that New Krypton readers have been waiting for; but at the same time Codename: Patriot feels terribly short, and much of the setup in this book only pays off in a subsequent volume. In this way, Codename: Patriot is definitely an important part of the New Krypton story, but these five-issue, $25 hardcovers are beginning to grate. A big source of the suspense of New Krypton thus far has come from the characters in the various titles and plotlines not knowing about one another. 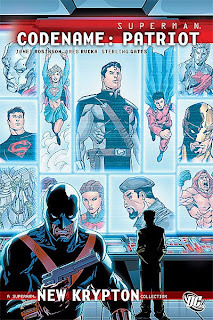 The identity of Superwoman was one; that Superman and Supergirl don't know that Nightwing and Flamebird are Superman's foster son Chris and Supergirl's old friend Thara respectively is another; that the source of all their recent troubles is Lois Lane's father General Sam Lane, thought dead, is a third. Codename: Patriot detonates this, bringing everyone out into the open, and this makes it a major storyline. Of them all, I'm most interested in what Lois will do when she finds out about her father; she has blamed Supergirl so far for Superwoman's death, but learning about her father should go a long way toward revealing the real culprit. Unfortunately, I'll have to wait until the next Supergirl collection, Friends and Fugitives, to learn Lois's reaction, and also to see many of the reunions promised in Patriot. Because Same Lane employs a shapeshifter, even though Supergirl learns about Thara, the "Thara" that she actually meets is a fake; similarly, even though Lois tells Superman about Chris, Sam Lane captures Chris before he and Superman ever meet on-screen. There's a lot of information passed around in Patriot, but ultimately it boils down to a story of the bad guys capturing the good guys; that there's so much build up and no resolution found in Patriot feels terribly unsatisfactory. Also, with this book I begin to feel the presence of the yet un-collected New Krypton co-features and tie-ins. Codename: Patriot hints at the presence of Captain Atom, but his co-feature is nowhere to be found, and so elements like Atom and the magic Mirabai go unexplained -- it's as if I've missed a part of the story, even though I haven't. (I've heard good things about this Captain Atom co-feature, and I hope it gets collected eventually.) There's also the suddenly-important, out-of-nowhere presence of Outsider Geo-Force's homeland of Markovia; I know Outsiders will eventually tie-in with New Krypton, but again I wasn't sure if Markovia's role was meant to be new or if I'd missed something here, too. Still, what is in Codename: Patriot is very good. I enjoyed Superman and Lois's reunion and Lois's revelation about Chris; it was also fun to see Superman, Supergirl, Mon-El, and the Guardian all together (and there's some nostalgia to a Supergirl/Mon-El team up since, some retcons ago, the Matrix-Supergirl played a big part in getting the Valor-Mon-El on his way). Sam Lane is a wonderfully malevolent bad guy here, playing all sides against each other, and I liked the out-of-the-blue revelation that he's got an entire magic dimension on his side. The writers do a nice job (and I sense Rucka's hand here specifically) playing with the identity of the Patriot; we think at first that it's the Kryptonian assassin Ran-Dar, but learn finally that Lane is the Patriot, able now to emerge from the shadows. As well, the book closes with another Jimmy Olsen special by James Robinson, which reminds us once again why we loved Robinson's writing so much all those years ago. I started out disappointed in this issue, as Robinson and artist Matt Camp offer one too many needless, large paneled pages of Jimmy rescuing a mystery person from a fire ... but then that mystery person turns out to be Erik Storn, nee Erika, from Peter Milligan's short-lived Infinity Inc. series. What follows is a wildly wacky series-bending sequence in which fellow-Infinitor Natasha Irons reveals she was hired by Tim Zanetti, Jr., son of the title character in the equally short-lived Breach series, to inflitrate Sam Lane's operation to try to find Breach, when in fact what Irons finds is Captain Atom. Robinson has no good reason to use and give closure to Infinity Inc. and Breach, but it's a boon for continuity wonks and I found it delightful; I'd argue it's this attention to randomness that was part of what I enjoyed in Starman, and it brightens the end of Patriot somewhat. So, when New Krypton is done, Superman: Codename: Patriot will be a turning point for the series, but I wish DC had included a couple more issues to round out the book. New Krypton gives the Superman titles a life I think they'd been missing for a while, but I'm convinced the hardcover format necessitates more than just five issues collected. I know this keeps coming up, but...$25US for 5 issues? What were the original issues, $2.99 or $3.99? That's just brutal! What's the incentive to wait for the hardcover? To wait for the hardcover versus the single issues? Well, you know my reasons and I won't bore you with them again. To get the hardcover versus the paperback? For me, it's the timing, for one (I don't want to wait for the paperback). It could also be inertia and collector-itis -- I have other parts of New Krypton in hardcover, therefore I want this one in hardcover, too (collector-itis being my id, whereas my wallet is teaming with my super-ego). But it works in reverse, too, as with Green Lantern Corps: Emerald Eclipse -- I don't have other hardcovers of that series, ergo I don't want to start in hardcover halfway through. Brutal, indeed. But enjoyable if we put the money aside. I think of the hardcovers as a long-term investment, as something a little more durable than a standard tpb. But even I agree this price is ridiculous. definately over-priced by five dollars. The quality of paper is very poor too. It's getting worse.